Thank you for giving our company a chance to help you in your everyday cleaning needs. American Diversified Products, Inc. has been in business for over 30 years. Throughout the years we have managed to earn the trust of a vast customer base. In this highly competitive marketplace, where hundreds of cleaning products are introduced daily, UPPER HAND, "The Cleaner that Cleans Everything" has managed to obtain and maintain the loyalty of over One Million customers nationwide. Uncompromising pride-in-product is stirred into every batch. Quality that continues throughout each step of production. It's that simple! Once you've tried it, you'll never go back. It quite simply, speaks for itself! In over One Million homes and businesses UPPER HAND has become the #1 choice. 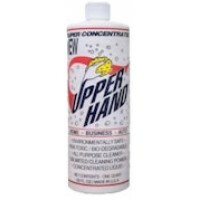 UPPER HAND is manufactured with the use of distilled or soft water. By doing so, we are able to put an additional amount of chemicals in UPPER HAND. These chemicals have ..
UPPER HAND is manufactured with the use of distilled or soft water. By doing so, we are able to put an additional amount of chemicals in UPPER HAND. These chemicals have enzymes which ..